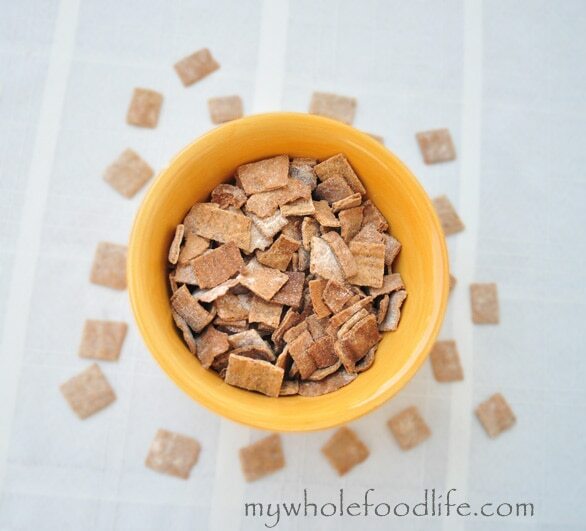 I made you some Homemade Cinnamon Toast Crunch! One of my favorite things to do is to re-create healthy versions of unhealthy foods. Cereal is one of those things I didn’t think I could try, but boy was I wrong! Not only does the store-bought cereal contain a lot of processed sugars and additives, it is also not gluten free. My version is! I am trying to make all my future recipes gluten free. This was a big hit with my older daughter. She will eat my homemade granola, but she liked this even better. I’m not going to lie, this recipe is kind of involved, but it is worth it. I promise! Why buy cinnamon toast crunch in a box when you can pull it out of the oven? Mix all the dry ingredients in one bowl and wet in another bowl . Once everything is combined, gather the dough into a ball and wrap in plastic. Stick it in the fridge to firm up (I waited about an hour). Once firm, cut the dough in half with a bench scraper . Put one half on top of a sheet of parchment paper that has been lightly sprinkled with flour. Take the plastic wrap the dough was wrapped in, and place it on top of the dough. That way, you can roll the dough thin without it sticking to the rolling pin . Roll the dough as thin as you can. It will probably cover the entire baking sheet. If you want to add the sugar coating, you can do it now. Just brush the dough with water, and sprinkle the cinnamon sugar mixture on top. I didn’t even do that and it was still good. Use a pizza cutter to score the dough. I cut mine into little squares, but they were not all uniform. Once you have done all that, repeat the steps with the second half of the dough. Then carefully flip each piece and bake for another 15-20 minutes. Watch the cereal carefully, because it can burn easily. Also I stored it in a glass jar in the pantry. It should last at least a week or two. Enjoy! I just made this tonight and it is GOOD! My 3 kids had a few pieces before bed and they all thought so too! Thank you for the recipe, especially Gluten Free!!! It was quite time consuming to do the whole "flipping" process because many of the pieces were stuck on the bottom. But all worth it in the end for sure! I used wax paper, I haven't seen parchment paper - I thought they were the same thing but maybe I'm wrong. Next time I may try a bit of coconut oil brushed on the paper (I did use coconut flour to dust it). I'm so happy you enjoyed this recipe! I was just thinking I need to make it again soon. Hi, I am just curious why you decided to make this (and so many of your recipes) gluten free? We just don't eat much gluten. I don't think it's a bad thing for everyone, but we try to limit it. Many of my readers are gluten free as well. You are more than welcome to use a wheat flour if you like. I am going to try Graham flour instead of sorghum flour since I don't have any. Other than it not being gluten free, what are your thoughts on this? I was thinking cinnamon toast crunch and other similar cereals have that graham flavor anyways so it may help it to taste similar, but wasn't sure what the dough consistency would be like to work with. I've only used the Grahm flour once before. I have never used graham flour before, so I don't know how to compare it. This dough is kind of sticky, but the end result is delicious. I must have done something wrong as I made this (using eggs and whole milk) and the dough really did not firm up after leaving it in the fridge. Any suggestions? I don't use sorghum flour so any recommendations of things to make using this flour now that I have it? thanks! What flour did you use for this? I used Bob's Red Mill Gluten Free Sweet White sorghum flour and whole wheat oat flour I bought at Whole Foods. thanks! That should have worked fine. The dough never gets super firm like normal cookie dough. That's why I roll it out on parchment paper and put plastic in between the rolling pin and the paper. Did you end up trying to use it? I'm glad you liked them at least. :) My kids loved them, but they have never had the real cinnamon toast crunch. I just adore these! Made another full recipe today (as crackers) this time with brown sugar instead and WOW :D. I thought they were great to begin with. Now I have a nice homemade snack to go with honeyed goat cheese when the family arrives. I love your blog and made this the other day. It was a lot of work but the cereal didn't taste like cinnamon toast crunch - rather like soft baked squares. Did I do something wrong? I attempted to make this in order to substitute the cinnamon toast crunch my kids love. It should have been crunchy. Was it not? Did you roll it our super thin? I'm sorry you didn't like it. Hi Melissa, is there anything I could sub for the sorghum flour? The only flours I have on hand at the moment are almond, spelt, coconut and brown rice flour. Could any of those possibly work? Substitute for almond milk? We have nut/treenut allergies. Something thicker like whipping cream? Or is whole milk suffice? I think you could probably use any milk in it's place. Could I use millet flour instead of the oat flour? I have never tried with millet flour, but it might work. Hi Melissa, Thanks so much for all your delicious recipes. If I use the packaged gluten free flour (Bob's Red Mill) in place of the sorghum flour do I need to add xantham gum? I don't think so. I have never used xanthan gum in any of my gluten free baking. I usually just add an extra egg. You totally rock! I'm thinking this dough might also work as a breakfast bar crust. This sounds perfect! Cinnamon Toast Crunch is my girls favorite cereal and I've taken all their sugary cereals away. Hopefully they will appreciate/like this! Thanks Cristy! I hope it's a hit with them. My 5 year old loves this! Hi, I'm a newby at the "whole food" lifestyle, and don't really know WHAT I'm doing yet, but I'm trying to get some yumm looking recipes together, and this one caught my attention; but, I'm afraid I dont know what a "flax egg" is. I clicked on the link and it showed me a bag of flax SEED, but can you tell me how I would use it iin this recipe? Thanks! Sure! Here is how you make a flax egg. https://mywholefoodlife.com/advice/how-to-make-a-flax-egg/ FYI, you can use a real egg if you like as well.